Posh manager Graham Westley has applauded the club's work in the transfer window. Peterborough United manager Graham Westley was delighted with the club’s work in the January transfer window. Posh signed six players in the last month of trading - they also picked up Jordan Nicholson in December - including the prize capture of Exeter City striker Tom Nichols on deadline day (February 1), for a initial fee of £250,000 according to the Exeter Echo, but considerably more according to Posh chairman Darragh MacAnthony. New signing Tom Nichols is expected to make his Posh debut at St Neots. Nichols will make his Posh debut in a friendly at St Neots tonight (February 2, 7.30pm kick-off) and Westley can’t wait to see him in action. “Everyone in football knows what a good player Tom is,” Westley stated. “So I am delighted that we managed to sign him. “The club have had him on their radar for a long time so it’s great to get the deal over the line. “I was with a Championship manager last night who admitted he was envious of Tom coming to play for us. Another Championship manager called me to congratulate the club on the signing - when that happens you know you have signed a very good player. “We all saw how good Tom was in the FA Cup tie against Liverpool and that’s his normal standard, it wasn’t a one-off performance. 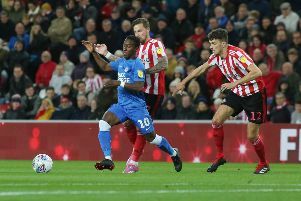 Posh signed strikers Shaq Coulthirst and Aaron Williams, midfielders Adil Naba and Callum Chettle and left-back Harry Toffolo (loan) during January. The contract of young full-back Tobi Adebayo-Rowling was cancelled by mutual consent last night (he immediately joined former Posh boss Dave Robertson at Irish League side Sligo Rovers), while defender Lawrie Wilson was allowed to return to Bolton after a month on loan at Posh. Striker Luke James ended his loan spell at Bradford City and promptly started another one at Hartlepool. Posh also tried in vain to bring goalkeeping legend Mark Tyler back to the club from Luton, but ‘The Hatters’ blocked the move. Tyler’s arrival would have enabled teenage back-up goalkeeper Dion-Curtis Henry to get some much-needed match practice on loan. Westley declined to dicuss Tyler by name, but admitted: “Dion needs games to aid his development. It’s no secret that we want him to go out on loan. What happened has happened though and that’s all I can say on that. “But if you had asked me at the start of January whether or not I thought we would lose Conor Washington, I would have said ‘yes’. “And if you’d asked me at the start of January whether or not signing two or three strikers to replace Conor was the right way to go I’d have said ‘yes’ again. “Not every signing works out, but by signing two or three, the chances of finding the next one on the production line increases. Toffolo, who missed Saturday’s (January 30) FA Cup draw at West Brom with a whiplash injury, is back in training and should be available for Saturday’s (February 6) League One game at Chesterfield.